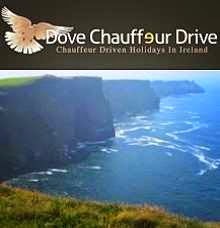 Today was our day touring the Burren of County Clare, and the awesome Cliffs of Moher. The weather was really lovely, with lovely sunshine in the afternoon. Our forecast for the coming days is really good also. Before leaving Galway this morning, we visited the magnificent Galway Cathedral ,which was opened in 1965 by Cardinal Cushing from the USA, Here we have, from the left, Traci, Deborah, and Allison, pictured in the main aisle of the church, with the beautiful Rose stain glass window in the background. The chapel dedicated to the Mother of Perpetual help, inside the cathedral, is really special, and here we have Brian, who sadly, recently lost his own mother. What a nice young man Brian is and we express our condolences to him and to his family. Our first stop off in the Burren, was the ancient Poulnabrone Dolmen, a burial tomb, dating back to the time of the ancient settlers in this area. It is not known who was buried here, but it is no doubt somebody held in high regard back in those ancient times. Then it was on to the matchmaking town of Lisdoonvarna, and here are my happy party with, from the left, Bill, Deborah,Traci, Allison, and Brian. This was the town where the farmers would congregate after the harvest every year looking for a wife, and the ladies, seeking husbands, would gather there also. Then the matchmakers, professional experts, would try to find them a suitable partner. The matchmaking continues to this day, and people now gather there every September and early October, Anybody interested? If so, just come along, and who knows? The Cliffs of Moher are one of the most visited places in Ireland, and what a lovely day it was there today. It was extremely busy as we are now in high season, but a visit here is a must on any visitors program. Tomorrow we begin our journey to the south, and on to the wonderful town of Killarney, Plenty more excitement to come.